I'm a firefighter, God, so I know I've been in some tough places before. But this . . . this not knowing the people I love . . . this is the hardest thing I can imagine. The last thing Jake Bryan knew was the roar of the World Trade Center collapsing on top of him and his fellow firefighters. The man in the hospital bed remembers nothing. Not rushing with his teammates up the stairway of the south tower to help trapped victims. Not being blasted from the building. And not the woman sitting by his bedside who says she is his wife. Jamie Bryan will do anything to help her beloved husband regain his memory, and with it their storybook family life with their small daughter, Sierra. But that means helping Jake rediscover the one thing Jamie has never shared with him: his deep faith in God. Jake's fondest prayer for his wife is about to have an impact beyond anything he could possibly have conceived. 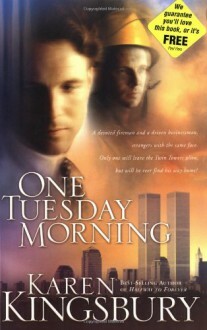 One Tuesday Morning is a love story like none you have ever read: tender, poignant, commemorating the tragedy and heroism of September 11 and portraying the far-reaching power of God's faithfulness and a good man's love.